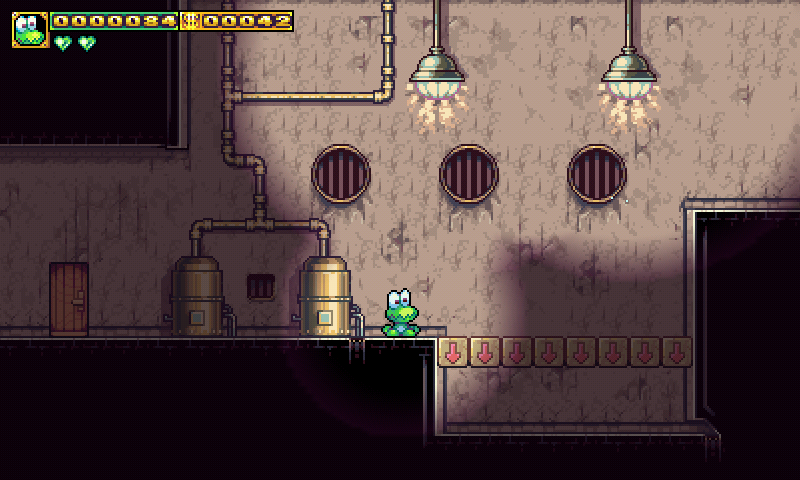 Frogatto is a classic-style 2d adventure game, starring a certain quixotic frog. It's made by the same team that brought you Battle for Wesnoth, and features the same handcrafted love of high-end pixel art. 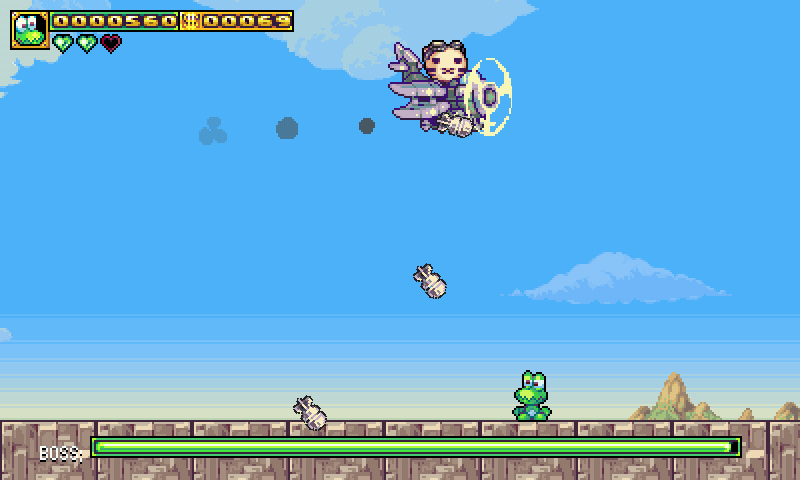 Frogatto is a side-on "platformer" or "jump and run" game, where you lead our titular character on a humdrum errand that turns into a daring adventure. Frogatto's key mechanic is an unusual twist; like any frog, he jumps, swims, and snags bugs with his tongue, but unlike any frog before him, can spit those bugs out with deadly force. 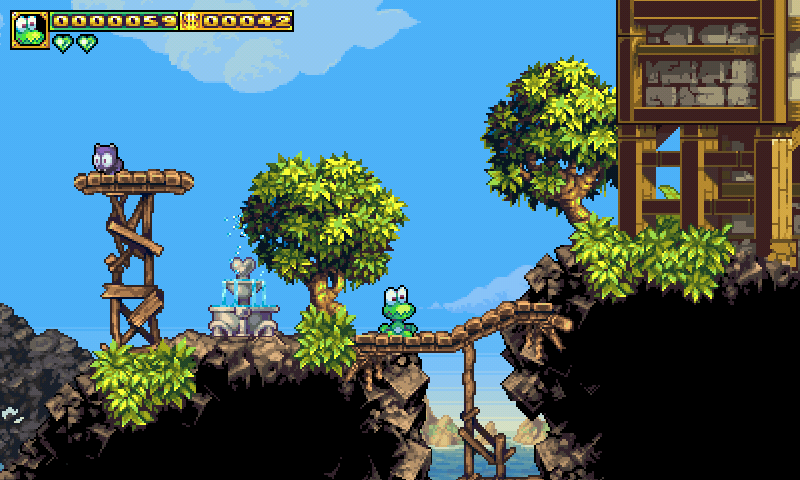 Not merely an action game, frogatto is a full, classic adventure game, with characters to talk to, things to buy, puzzles to solve, and a wide, complex world to explore. Features: - grab enemies with your tongue and spit them to deal damage - buy powerups to enhance and unlock new abilities - arcade mode, giving instant access to action-only gameplay on randomized levels - forgiving savegame/respawn system so you don't have to be afraid of losing progress - playful dialogue writing that tries not to insult your intelligence - massive soundtrack with over an hour of original music - sprawling, complex world with over 70 levels to explore, and tons of secrets to find - OpenFeint and Achievement support To find out more about the game please visit http://www.frogatto.com/ Reviews: - [3/4 SlideToPlay.com] "a fun and surprisingly deep platformer" - [4/5 AppSpy.com] "boy-howdy is this an amazing visual feast!" - [n/a TouchArcade.com] "totally worth checking out." Finally, the main game does not crash, unlike in older versions! This is very polished if a bit short. The story & dialogue does a good job of subverting the typical story of these sorts of games. :) "Coin Race" in the Arcade section doesn't work - have to hold Pandora button to return to desktop. will this PND ever be updated? frogatto keeps being updated on github, and this version is probably very outdated now. Wow, amazing graphics! Great game.